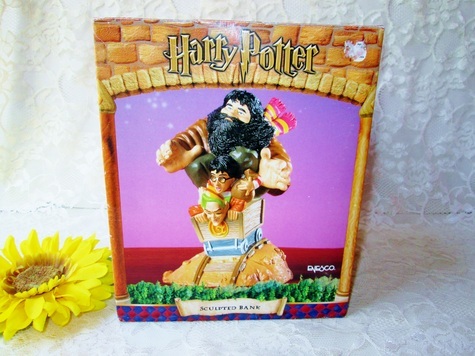 Vintage Harry Potter new in box never used bank with removable locking stopper in bottom for getting money out, slot in back of Hagrid's head is where money goes in. Features characters from Harry Potter movie, Hagrid, Harry, Troll. Measures 7-1/2" tall by aprox 5" wide across front. Made by Enesco, made of plastic. Bright and colorful collectible for kids room decor. Excellent mint new condition in original box.